Photo courtsey of the National Park Service. In observance of Veterans Day, some City offices and services will be closed on Monday, Nov. 12, 2018. Both museums are closed on Nov. 12. Closed, except for the intake desk and reclaims. Credit cards will not be accepted for reclaims on that day. Most City Offices are closed on Nov. 12.
Business and ticket offices closed Nov. 12. All branches are closed on Nov. 12. Open regular hours on Nov. 12. Report issues anytime with the OneABQ app. ABQ RIDE will run a regular weekday schedule on Nov. 12. The Albuquerque International Sunport is open Nov. 12. Aquarium, Botanic Garden, Tingley Beach, & Zoo open until 5 p.m.
Open during regular store hours. Open dawn to dusk on Nov. 12. Indoor pools open on Nov. 12. Outdoor pools are closed for season. If your collection day is Monday, your trash will still be collected on Nov. 12. The ABQ BioPark is saluting military personnel with $1 admission to one facility for themselves and up to five accompanying family members on Monday, November 12. Learn more about the ABQ BioPark Veteran's Day Deal. The City of Albuquerque Parks and Recreation Department is saluting our nation’s veterans with special discounts on golf, tennis, and swimming this Veterans Day. The specials will be available on Sunday, Nov. 11 and Monday, Nov. 12. Learn more. 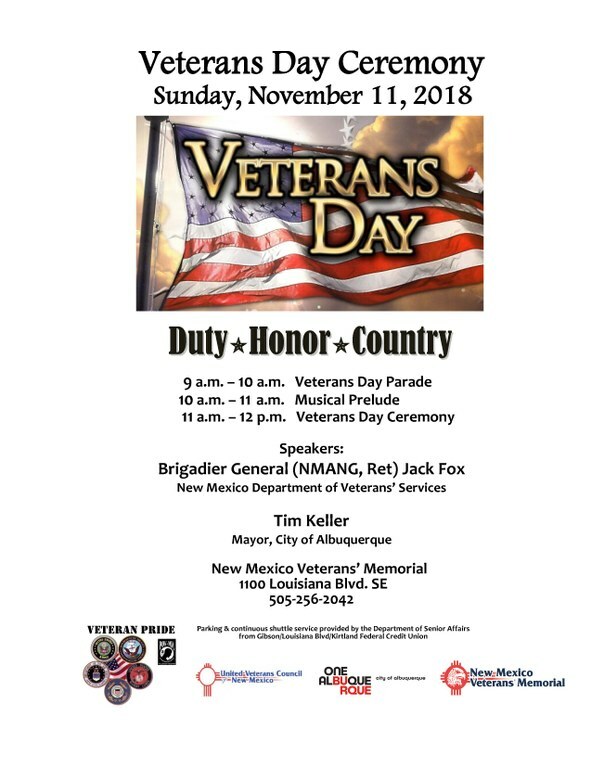 Visit ABQtodo for a complete listing of Veterans Day events. View information about events taking place this fall in Albuquerque.